A city in southeastern British Columbia has declared war on a burgeoning pigeon population. 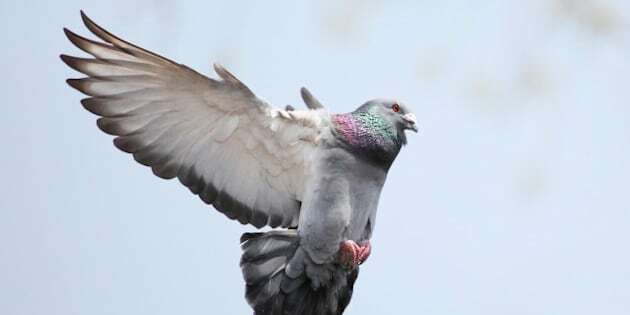 The Kootenay city of Trail will pay $25,000 to hire a company to trap the pigeons and move them elsewhere. There are also plans to pass a bylaw that will enforce a fine for anyone caught feeding the pigeons. "There are hundreds and hundreds of them and of course they multiply very rapidly," said Mayor Deiter Bogs. "They are definitely creating a major health hazard." The Ministry of Transportation has already installed spikes on a bridge over the Columbia River to keep pigeons from nesting there. "The bylaw is to basically stop people from feeding the pigeons because that is compounding the problem," he said. "The other thing is to trap the pigeons and take them to a conservatory down on the coast."